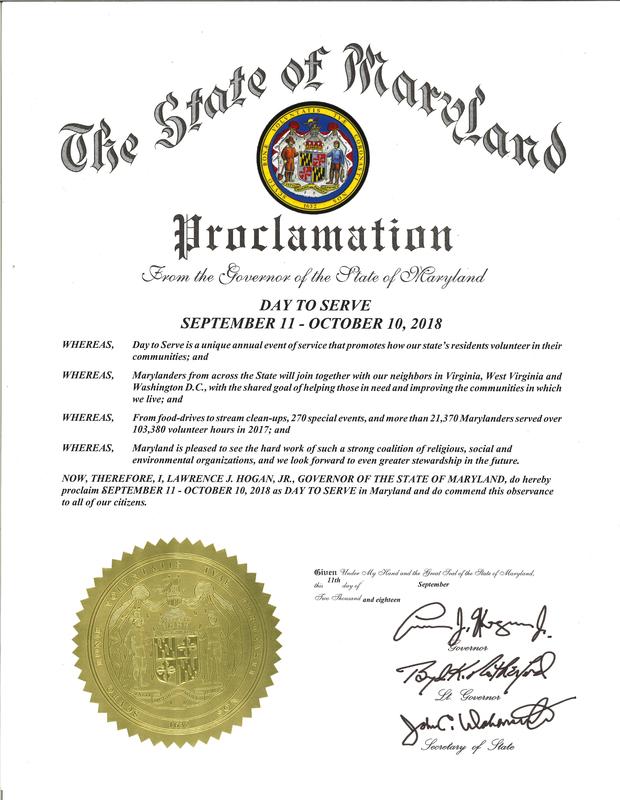 Spotlighting the extraordinary spirit of volunteerism within Marylanders, Governor Hogan has announced that from September 11 to October 10, 2018, Maryland will again participate in the Day to Serve Initiative. Each year, Marylanders from across the state join our neighbors in Virginia, West Virginia, and Washington, D.C. to participate in Day to Serve, a month-long initiative encouraging citizens to choose a day to participate in a volunteer activity in their community. Last year, over 20,000 Marylanders dedicated over 100,000 volunteer hours to communities across Maryland. Join in the efforts to help make this year another success! Let’s get all Marylanders talking online, too! Like us on Facebook and follow us on Twitter. Use the hashtag #MDDTS2018 and #iServeMD to share your event and build the Day to Serve community.For extra fun, print out and use the Day to Serve 2018 Hashtag Cutout and Instructions! For more information, visit daytoserve.org. Stay tuned for more details!